The rescued have been shifted to 30 relief camps and efforts were on to reach the others held up on hilltops. 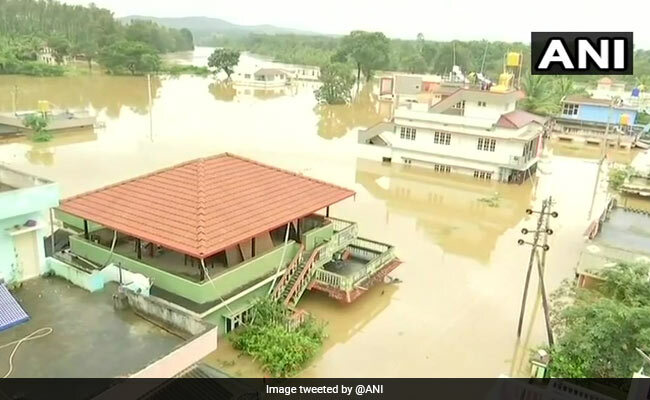 About 3,500 marooned people were rescued in Karnataka's worst flood-hit Kodagu district even as incessant rains hampered relief work, the government said today. "The Indian Army, Navy and other state and central agencies have rescued more than 3,500 people so far," a statement from Chief Minister HD Kumaraswamy's office said. Of the hundreds stranded across this flood-hit hilly district, about 270 km from Bengaluru, the 3,500 rescued till Sunday noon have been shifted to 30 relief camps and efforts were on to reach the others held up on hilltops. The exact number of people still stranded across the district could not be ascertained from the officials. Located in the Western Ghats mountain ranges, the coffee-growing district is the worst-hit due to the south-west monsoon rains since June first week. The incessant rains have been causing flooding and landslides across the region, damaging the arterial roads. Over 60 people have been stranded in Mukkodlu village of the district, but airlifting them has not been possible due to bad weather, Kumaraswamy said on Saturday. About 300 people were rescued on Saturday, including more than 30 senior citizens and 50 children. About 60 Dogra Regiment soldiers, 12 naval divers, National Disaster Response Force (NDRF) officials, 525 fire service personnel and Home Guards are among those working on rescue operations. In total, over 1,000 rescuers from state and central agencies have been engaged in the rescue operations. Hundreds of volunteers from state capital Bengaluru and across the state have been gathering relief material, including dry food, water, milk, clothing and medicines, and distributing them to those in the temporary shelters in the district. The water being released from Harangi reservoir in the district across Harangi river, one of Cauvery''s tributaries, has been adding to the flooding of towns and villages in the region. Over the last 24 hours, the district received an average rainfall of 5.4 cm, according to the India Meteorological Department (IMD). Few parts of the district received rain upto 11.5 cm. Revenue Minister RV Deshpande has been overseeing the rescue and relief operations. The state-run Karnataka State Road Transport Corp on Sunday resumed all its intra-state bus services towards Kodagu and Mangaluru and inter-state services towards Kerala. The bus services were suspended over the past few days towards Kodagu, Mangaluru and flood-hit Kerala due to the landslips and damaged roads caused by the rains. The South Western Railway''s (SWR) train services were, however, cancelled or partially suspended and diverted between Yesvantpur in Bengaluru and Kochuveli in Thiruvananthapuram, Mangaluru to Karwar in Uttara Kannada due to landslides and floods. The SWR on Sunday transported relief material including water, food, milk, clothing etc., for thousands of people living in shelters in neighbouring Kerala.